I covered building two different structures where I used my Cricut paper cutting machine for a large portion of the construction in these threads: http://www.railroad-line.com/forum/topic.asp?TOPIC_ID=50263 and http://www.railroad-line.com/forum/topic.asp?TOPIC_ID=50619 I've started another project using the Cricut machine. This is a kitbash and this time I'm only going to document the few steps I take where I use the machine. I won't be covering the work not involving the machine. I'll explain why later. I'm currently assembling the truss rafters. The building is 50' long and it's going to take 26 of these buggers! I started by drawing a rafters on my computer. I loaded that drawing into the Cricut machine and scribed the design on a piece of 0.040� styrene. I used a light setting since I wasn't trying to cut the styrene. I enhanced the picture by wiping black acrylic paint on the styrene. This is going to become the jig I use to build the rafters. Notice the bottom line is longer than the rafter. This is exactly 6� (1:1 ratio) and it's the way I tell Cricut the drawing is 6� wide. The truss is then scribed by the machine to exactly match the drawing dimensions. 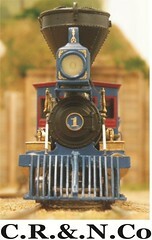 The rafter is HO scale 38'- 6� wide. I added scrap pieces of styrene to hold the sticks of wood on the jig. I modified my drawing, extending the lines to use it as a guide for cutting the individual pieces of lumber. It's a simple matter of laying the stick on the drawing and cutting the correct length and angle. I printed multiple drawings because I figured the razor would start to damage the drawing as I cut multiple pieces of wood. Here's a completed truss. It takes about a half hour to make one - Only 25 more to go! Those gusset plates were also cut on the Cricut machine. They were cut from a sheet of colored card stock. It took the machine a half hour to cut them and it took me close to an hour to pick all the little pieces off the mat. But! If I had tried to cut them all by hand it would have taken much longer and they wouldn't be any where near as accurate. The mat the card stock is on is very sticky. My first attempt at cutting the gussets was done on an old mat that had lost most of it's stickiness and the blade started to lift the gussets off the mat and things got real messy. That old mat still can be used. I'll use it on heaver material with painter's tape on the edges to hold the material steady. I'll save this mat for thinner materials. This might give you an idea why it took so long to pick the gusset plates off the mat. I'll be glad when I'm done assembling the truss rafters and I can see some progress on my building. Looks like you're having fun with another neat project. Hey, it's keeping your mind sharp! Interesting process, George. I originally thought you were going to cut all of the trusses using the Cricut machine. Neat idea to have it help you make a jig. Thanks, Jim. I need all the help I can get. Chuck, based on the time this is taking, I'm going to cut one out using card stock and see how it looks. I'm afraid I won't be able to get it to look like wood, but it's not that big a drill since I already have the drawing. It might have the additional benefit of keeping my mind sharp. It might have the additional benefit of keeping my mind sharp. Next George will be making FastTrusses. At Chuck's suggestion, I cut a set of trusses this morning. I laminated two pieces of cardstock together for thickness and learned something. I glued the first one using Krylon Low odor Spray Glue (on the right). It must be water based because the clean up instructions are to use soap and water. You can see it warped and wasn't going to work, so I laminated the second piece with Loctite Spray Adhesive (left). I ganged my drawing to cut six trusses. The machine cut the rafters very nicely. I was talking to a fellow train club member last night, who is an architect, and he said the trusses can be on four foot centers, not two foot centers like I planned. That means I only have to make half as many. 13 trusses are within my level of patience and I'm half way there. I learned some things. First, avoid Krylon spray adhesive when using card stock. Second, I learned how to use the Cricut app on my iPhone. It's very straight forward. Besides the limitations of working with a small screen, you can't create drawings, you can only use drawings already in your Cricut files. Other than that it's a good app and will allow me to take the Cricut machine to the club to give a clinic. These look good to me! Congratulations! Just don't let the Fire Marshal in to see them ... they dislike truss roofs because they're not as strong as stick-built roofs, so the firefighters can't work as long on them before they need to get out. Thanks for the hints on adhesives, too. Very useful! George, what thickness were the individual pieces? Those came out great, George! Thanks for the nice comments, guys. Pete, in my HO world we don't worry about no stikin' fire marshals. Carl, the laminated pieces are 0.018" thick. Looks very nice George! The Cricut machine does a great job! Thanks, H�kan. The machine has a lot of possibilities. Here's one of those possibilities I mentioned, H�kan. I have a friend that asked me if Cricut could cut out pieces of card stock to mask off windows on a DPM kit he was building. Once I got the dimensions right it was a piece of cake. The building has 17 of this size windows plus several different sizes on the front � pretty difficult to do by hand. That's a good idea, George. Especially with a few of my kits that seem to have endless windows. The thought of painting them all with a brush has probably helped them collect dust on the shelf.